My husband checked out of our short marriage after he decided he had fallen in love with a woman that he had met on an Internet dating site. In her book, Runaway Husbands, Vikki Stark writes about women who have been abandoned by text or a note on the kitchen table. However he chooses to abandon the marriage, in the first few days after he leaves, you feel numb, you find it hard to sleep or eat, and your mind tries to make sense of what has happened by obsessing and analysing. Abandonment by one spouse, is incredibly traumatic for the partner that is left behind because they usually have no idea that anything is wrong until they are discarded. The shock of your world turning upside down suddenly, including your plans for the future, and all the other fallout - financial, family and the rest, is like an emotional bomb being detonated. I felt I was living in the movie, The Matrix, the comfortable, safe, familiar existence that I thought was real had been an illusion and now I had been thrust, unceremoniously, and not through choice into an unfamiliar reality. 1. Try your hardest not to act like a crazy person! The tidal wave of emotion that crashed over me, when I saw her in his bed, threatened to destroy my sanity and drown my soul. If I had known what I know now, I would have just walked out and left them to it. Instead I tried to reason with them, I tried to explain how I felt, I slapped him, I swore and generally acted like a crazy person. I know now, my behaviour just provided the evidence that he needed to substantiate the stories that he had been telling her. He would have had to justify to her why he had been unable to leave me and now I was providing the evidence of my precarious mental state and my emotional dependence on him. He looked me right in the eyes, with a cold stare, and said, “I haven’t loved you for a long time”. She said, “He didn't want to hurt you. You have been so dignified through this whole process, don’t stop now.” I’m still not sure, what process she was referring to. I was desperately clinging on to the reality that I knew and I was trying to reason with them and make them understand the error of their ways from within that reality. This is pointless because he has spent months fabricating an alternate reality to justify his behaviour and that is the world that they are both living in. None of your arguments make any sense to them because they have already decided that you are just an irritating obstacle standing in the way of their life together. Within their reality, they were meant to be together, and if you would just go away, they could sail off into the sunset, and begin their perfect life. It hurts so much to be rejected suddenly and without any warning, by someone who was supposed to love you. Your immediate reaction is denial, you just want him back to stop the pain and make everything normal again. Trust me, I have been there, the more you try to reason with him, the more pathetic and unhinged that you appear. In a few months you will realise that you don’t want this man in your life – you really do deserve better than that. You are thinking, it’s all a terrible mistake, if he just comes back it won’t happen again. It will. If he has decided to bail out once, he will do it again. Do you really want to spend the rest of your life with a man you will never really be able to trust? The Number One rule is NO CONTACT. It is incredibly difficult, but the more you stay in contact with him, the crazier you get and appear to him. The woman he has left you for is new and exciting, and in comparison, you are a neurotic mess, ringing him hysterically, pleading with him to come home. I know, I was there! By staying in contact, trying to make him see how much you need him, and generally being crazy, you are handing him control over you and your life, and you are making the other woman look like a better option. 2. Don’t text him (or her) – AT ALL! Another huge mistake that I made was bombarding both of them with text messages. I went so crazy that my usual $40 per month, mobile phone plan cost $800 the month after he left! He would reply to my desperate texts with texts like, ‘there will always be a place in my heart for you’ and ‘if I could turn back time, I would.’ I found myself over analysing his replies – finding the hidden meaning that I wanted to be there. The sad, cold fact is that if any of what he replied actually meant anything, he would be home working on the marriage. I gave him ample opportunity to turn back time, all he had to do was stop having the affair and commit to our marriage. Either he was feeling guilty or he liked the thought that he could keep me hanging on to hope. The simple rule again is, NO CONTACT. There is nothing that you can text him that is going to make him change his mind and every time he appears to text you something nice, it sets you back on your recovery, because it gives you hope that he wants to fix the marriage. Block his number on your phone – if you have an IPhone, it is easy to block a number and an email address. After you have blocked him, delete the contact and the number stays blocked. Every time you want to text him, try saying the alphabet backwards first, this gives you enough time to get over the impulse. Texting her is a really bad idea – trust me I did this too! Firstly, if you are texting her angry insults, you are making her look good and rational, while you are nasty and crazy. She will show them to him and it will be more justification as to why the poor man needed to fall into the loving arms of a woman like her, after all his wife is obviously a vindictive, mean spirited person that just can’t let go. Secondly, I found I was having long text conversations with her, where she was advising me on what she thought I needed to do to sort myself out. I was in such a vulnerable place, I actually thought this was a good idea. I bared my soul to this woman, through text messages, which I’m sure just confirmed in her mind, how crazy I was. One of the last text messages that she sent me, before I blocked her number was telling me how she believed I was using my husband to boost my non-existent self-esteem and that I needed to find my ‘inner child’. The ironic thing was I was a strong, confident woman before he left, but of course all she saw was the crazy person that I had become. The rule again is NO CONTACT. By texting either of them you are handing control back to them. One of the many hurtful things that my husband did was announced on Facebook, that although we had separated, we were still friends. Firstly, I was still coming to terms with the fact that suddenly I wasn't married anymore and secondly without thinking or caring about how I felt about the situation, he announced to the world that I was still friends with him. I can see now it was his way of rewriting what had actually happened, so that he didn't look like the bad guy, and so that in a few months he could start posting pictures of his ‘new’ girlfriend without anybody knowing that she was his affair partner. The point here is I didn't need to see this – he is going to justify his actions with lies and half-truths and his Facebook band of ‘true believers’ are going to ‘like’ everything he says and does. But you don’t need to bear witness to it all – you cannot control what he decides is the truth or who believes it, your job here is to look after yourself and you can’t do that while you are looking at what he is posting. Block him on your social media, while you are obsessing about what he is posting, he is still in control of your emotions and thought processes. The first few days, I couldn't sleep or eat, I cried constantly, basically I was a wreck. I dragged myself to the doctor and he gave me Valium to help me sleep and anti-depressants. I have always been one of these people who doesn't even like taking Panadol, but I knew that I needed help. I would sleep for a couple of hours and them wake up and spend the rest of the night crying and going over everything trying to work out what it was that went wrong. The Valium allowed me to sleep through the night, and therefore allowed me to work on functioning during the day. After a few weeks I was able to substitute the Valium for a guided meditation app. There are lots of guided meditation apps available – try several out until you find one that you like. The app that I use has a guided meditation for getting you off to sleep and another one for if you wake up during the night. I was worried about taking anti-depressants, but my doctor explained it like this – I was floundering in the ocean under the water, not knowing what to do. The anti-depressants allowed me to put my head above the water and see the shore. I still had to swim to the shore, but the tablets helped me to see what direction to go. I’m a few months down the track now and I am able to make plans and set goals now. I have repeat prescriptions for six months and I feel confident that I won’t need to get another prescription. My doctor also put me on a Mental Health Plan. In Australia, being on a Mental Health Plan allows you to have bulk billed visits to a counsellor or psychologist. Having someone to talk to and give me strategies for healing has been invaluable. Many of us have been brought up ‘not to air our dirty laundry in public’ and that people don’t want to be burdened with other’s problems. But think about it like this – if your friend was hurting, like you are now, wouldn't you want to be there for them? Trust me, you don’t want to do this on your own – if you don’t have a friend or family member to talk to, you need to get to a professional counsellor. Talking about your thoughts and feelings is the first step on the road to healing. This is because, once those thoughts and feelings are heard by another person, they are no longer just your internal dialogue or negative self-talk which tends to be on continual repeat during the immediate crisis. You can really beat yourself up in the initial days and weeks after he leaves – if only I had not put on weight, given him more attention, not complained about him smoking and making the house smell. After all he has gone off with another woman, so I must be inferior to her, etc. Talking to another person, can bring a fresh perspective and clarity without the negative self-judgement which clouds your thinking about the situation. Another person, whether it is a friend or professional can see the situation from the outside and they can reflect what they see back at you, which in turn helps to change that internal dialogue. It’s about getting new input into that self-defeating thought process that plays on a loop continually in your head. In the initial period after abandonment, it definitely helped me to read everything that I could about other people who thought that they were happily married until their spouse left suddenly. There are places on the Internet, where you can tell your story and be part of a community of people who have experienced what is happening to you. Here for instance – tell your story on Suddenly Single, and know that other people care. Www.runawayhusbands.com is a great website and you can buy Vikki Stark’s book, ‘Runaway Husbands’ from the site too. After reading that book, you will definitely not feel alone! However, there comes a point where you need to move forward from why it happened. 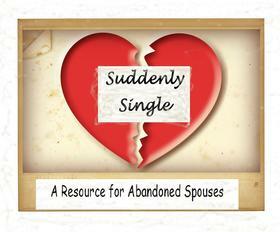 Being abandoned by a spouse suddenly, is an incredibly traumatic life event. You have witnessed an overnight change in your spouse’s behaviour – he has suddenly changed from being attentive and loving to being cold and uncaring. Your marriage has quickly and dramatically ended when just a short time ago you believed you had a happy and secure long-term relationship. Often he feels the need to justify to other people why he decided to walk out on the marriage without consulting his spouse, and his explanations leave you confused and questioning your sanity. My husband still has not come up with a satisfactory explanation, he says that he has no idea why he left me for another woman or why he needed to be on Internet dating sites, actively pursuing women while newly married. It is understandable that you want to make sense of why this has happened to you, but you also need to start gradually letting it be. One great tactic is have a set period of time every day when you do your obsessing and analysing. You could set aside two hours each evening and then reduce it to one hour, until you feel that you don’t need to read about it anymore. One day, you will find that you don’t need to find answers anymore because you no longer define yourself as an abandoned wife, you are now an awesome single, powerful woman with the potential to do anything. This is the point where as Tupac said, you “just leave the pieces on the floor and move on”. Vikki Stark has a great activity for obsessive thinking. Every time you start thinking about him, imagine a cleaning lady with a broom. She is sitting on a stool in the corner and as soon as he comes into your head, give the cleaning lady the order to start sweeping. Instead of thinking about him, picture the cleaning lady sweeping the dust and all those thoughts away. At first, it can take everything that you have, just to get out of bed. I remember describing to my doctor that I felt like I was wading through deep snow and my head felt like it was full of custard! Well that’s okay, goal number one can be having a shower and getting dressed. Once you are up and dressed, another goal can be watching a downloaded television series, something like ‘24’, ‘Breaking Bad’ or ‘Prison break’ – limit yourself to three or four episodes a day, but it is great for shifting your mind to something else. I have always enjoyed walking, but I found in the days after he left I just couldn't drag myself out. I was finding it hard to eat, so I just felt too tired to expend any energy. But one day I decided to try just to get round the block, the next day I tried two blocks and now I’m up to my usual 5ks again. Try downloading songs like ‘Superhero’ by the Script, ‘Fighter’ by Christina Aguilera, ‘Survivor’ by Destiny’s Child, ‘Hit Me with Your Best Shot’ by Pat Benatar, the lyrics make great motivation to pound that pavement!